Say. 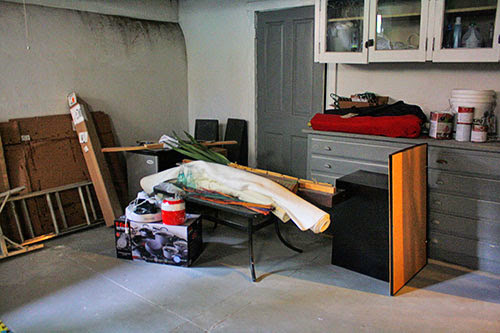 Remember when I didn’t clean out my garage for six years and then shared my shame with you? If you don’t, that’s worth a click over to read it. I’d forgotten how insane those “before” photos were, and that was my life. Of course, it was slightly (slightly) less shameful once I’d cleaned it all up, but it was still pretty incredible that it ever got that bad in the first place. The only good thing that came out of that experience (besides “after” photos made all the more impressive thanks to the “before”)? A complete self-awareness of when I’m headed down the same path. And two years after moving in without ever cleaning out – or just plain cleaning – our basement, I could see where this was going to end in four years or so. Just because there are no rotted out watermelons now doesn’t mean there wouldn’t be, is all I’m saying. Let’s survey the scene. Fortunately, most of that stuff is the foreground represents our dumping ground for items to donate – either to my parents (always, and somewhat surprisingly, willing to carry off all my unwanted junk) or to the Goodwill. But let’s look past that. Off to the left is more of my cardboard box hoarding. It’s still a bit of a problem. In the very back are tires and an unused mini-fridge, which are Mr. P’s and will apparently always lurk around our storage spaces. 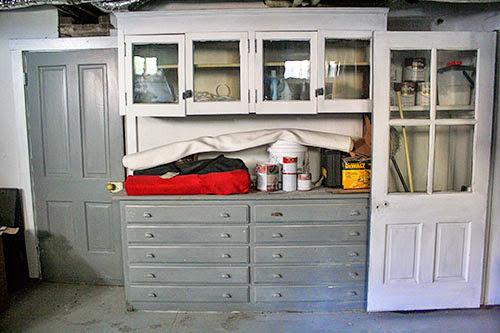 But the most nonsensical part is the workbench, with stuff (not for donation) piled upon it, beneath mostly-empty cabinets. Why am I complaining about small closets in our apartments while squandering all that storage space?! But it’s worse than you think. On the walls, you can easily see DIRT. Lots of dirt. 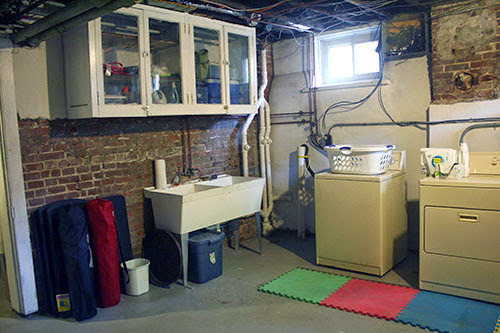 This is a basement, with four stories of a 120-year-old house above it. When the dust settles, this is literally where it falls. And while you can see it best on the sloped wall... it is not just on the sloped wall. 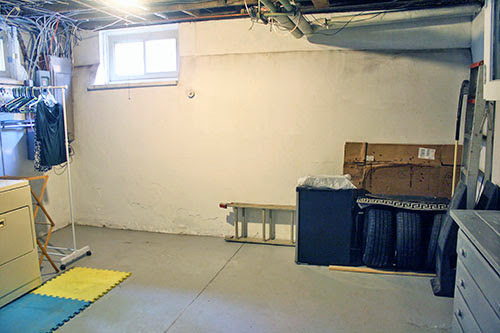 This is a very dirty basement, literally. Even after my parents hauled off what they wanted and Mr. P took the rest to Goodwill, it still was a pretty depressing semi-“before”. Let me be clear: I am not trying to be disparaging of the space itself! 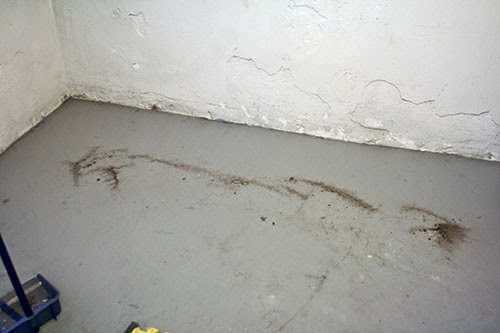 Sure, the cement floors aren’t exactly cozy, and the exposed wiring lacks some charm. But what is actually depressing is how poorly I was using the space. And the longer I didn’t do anything about it, the more it just felt gross and unusable. And so. Before it was completely taken over by spiders and dirt, I decided to do something about it. The first thing I did was make use of the plentiful cabinet space, which is safe from the dust storm. Sure, they’re not the world’s fanciest cabinets. But they sure can hold all those things I was keeping in our precious closet space upstairs and not using for two years. Like coolers, a space heater, and all but the most basic power tools. 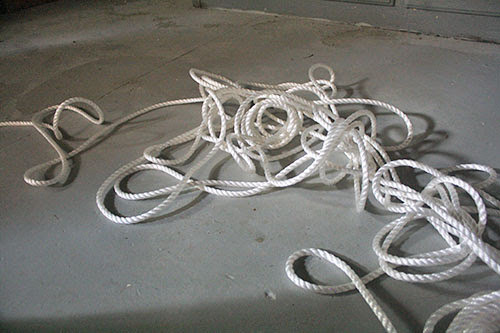 I also consolidated the few things I actually bothered to store down here in the first place, like this rope. Which was flung into a cabinet exactly like that two years ago. A good fifteen minutes of testing my patience later, I’d finally corralled it into something more respectable. Yes. 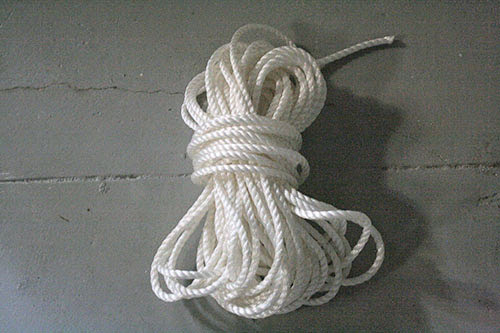 I am showing you before and after of a ROPE. If you don’t like it, then you clearly have not had to bundle a gazillion feet of tangled rope. 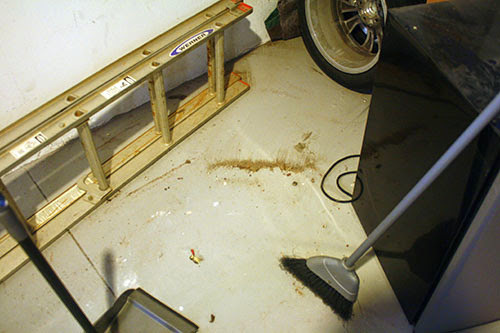 Once I’d stored everything away, it was time to tackle the spiders, wipe it all down, and sweep. The last one is a before-and-after unto itself. The hall just outside the doorway isn’t “our” part of the basement, so I didn’t sweep it up. See the difference?! We do our laundry down here, people, and I’m starting to wonder if our clothes might have been coming out more dirty than they started. That certainly was the case for my nose, as I learned when I blew it later that day (OH MY GAH SO GROSS). And finally, the end result? 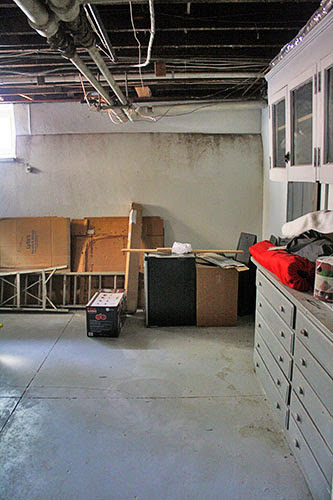 It’s not a pinnable before-and-after amazing transformation, so let me again point out a few things. The cabinets are now full and organized (we have baskets involved, people). 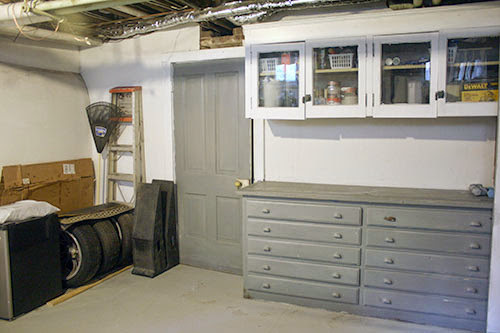 The workbench is cleared for actual working, should we so desire. There is but a single cardboard box back there, reserved for painting projects (thanks to Mr. P for hauling the rest FIVE STORIES UP to the attic). And all the things too big to store in the cabinets are in that single pile. See? The walls are floors are way less dirty (there’s only so much I could do). I feel much less weird about hanging my clothes down here to dry! And speaking of laundry... I didn’t get a before shot of this side, because it was less disastrous. 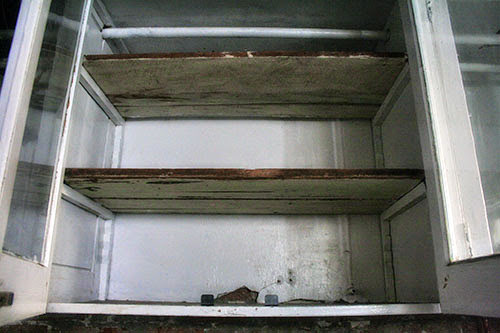 But now there are things in the cabinets, where there once were none! Obviously this is far from a beautiful space, but it’s much more usable now, and far less depressing. I have a few things I’d like to do down here – some cute laundry system would be nice (rather than just hanging out on the dryer), we could probably retire the multicolor pad in front of the washer/dryer (it’s the landlady’s), and I have some shelving units that I could set up to store even more down here. 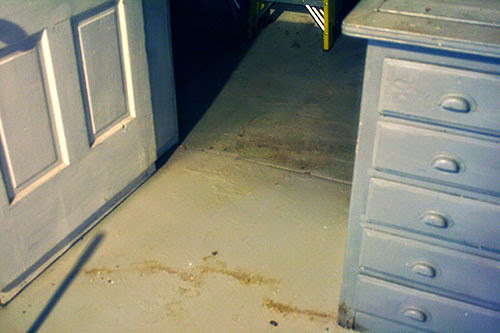 Not to mention all the scrubbing I could still do, were I so inclined. But for now... well, there’s some closet space to play with upstairs. I’ll show you what happened up there tomorrow!